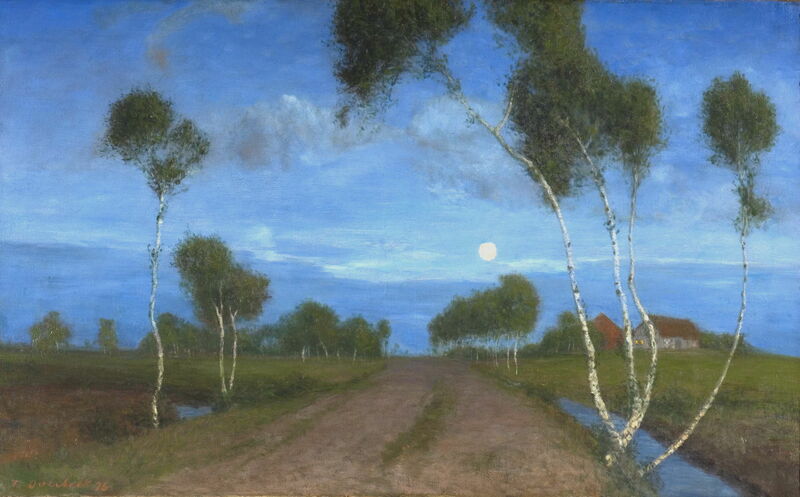 Fritz Overbeck (1869–1909), Evening on the Moor (1896), further details not known. Wikimedia Commons. The late nineteenth century saw the establishment of many artists’ colonies beyond the better-known ones in France like that at Pont-Aven. One of Germany’s more successful colonies was that at Worpswede, in an area of boggy moorland known as Teufelsmoor (“devil’s moor”), to the north of Bremen, in Lower Saxony. It started with Fritz Mackensen, and in 1889 he was joined by Otto Modersohn and Hans am Ende. Modersohn later married Paula Becker, who as Paula Modersohn-Becker is recognised as an important and innovative expressionist. Perhaps even better-known are the writers and poets who went to Worpswede, including Thomas Mann and Rainer Maria Rilke. It was Otto Modersohn who, in 1894, convinced another young artist to join the colony in its small village on the side of a low hill overlooking Teufelsmoor: Fritz Overbeck (1869–1909). Overbeck had just completed four years of study at the Kunstakademie Düsseldorf, where he had been taught by landscape painter Eugen Dücker (of whom more in a future article) and the history painter Peter Janssen. Fritz Overbeck (1869–1909), A Stormy Day at Teufelsmoor (date not known), oil on paperboard, dimensions not known, Museum am Modersohn-Haus, Worpswede, Germany. Wikimedia Commons. Overbeck quickly became fascinated by Teufelsmoor and its many moods. A Stormy Day at Teufelsmoor is undated, but appears to have been one of his earlier plein air paintings made near the colony at Worpswede. Fritz Overbeck (1869–1909), Storm on the Moor (1895), etching, dimensions not known, Albert-König-Museum Unterlüß, Unterlüß, Germany. Wikimedia Commons. 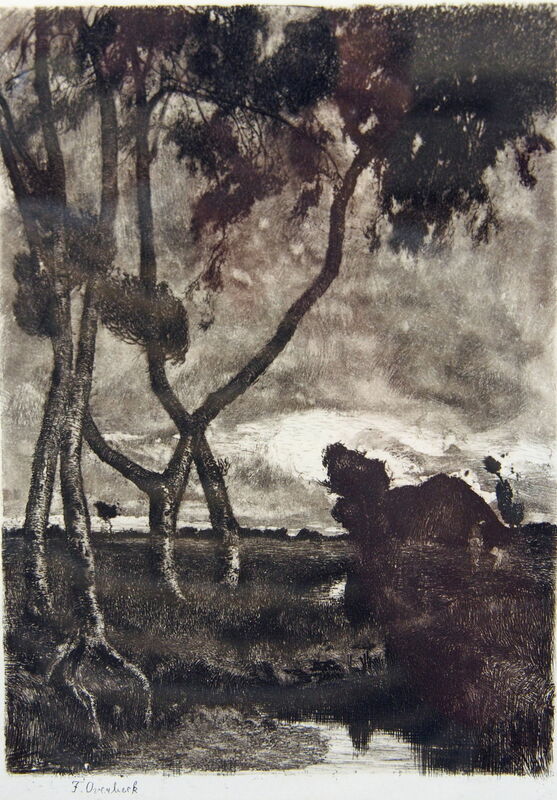 From that or a very similar painting, Overbeck made his (reversed) etching of Storm on the Moor (1895). This shows similar passages – the farm at the left, the clump of birch trees – to the painting above, but shows one of the streams draining the boggy land. I have been unable to trace any other prints of his, but for one made so early in his career, this appears very promising. In 1895 or ’96, two young artists visited the colony at Worpswede. One of them, Hermine Rohte, came in search of Overbeck, whose work she had seen in the Glaspalast in Munich, where she was a student at the Women’s Academy. In the autumn of 1896, Rohte and Overbeck became engaged, and the following year they married. Fritz Overbeck (1869–1909), Group of Birch Trunks (c 1896), media and dimensions not known, Museo Castello San Materno, Ascona, Switzerland. Wikimedia Commons. 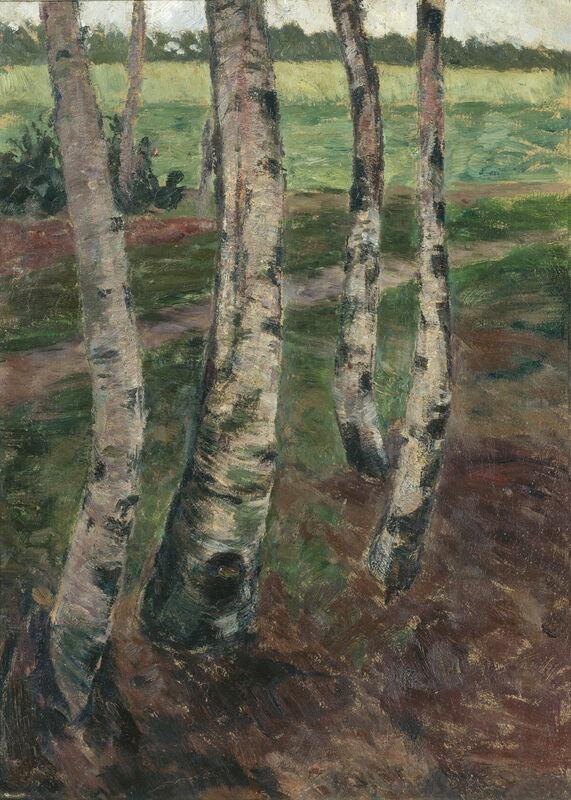 Overbeck seems to have been particularly interested in the sinuous forms of lichen-encrusted trunks of birch trees, as shown in this painting of a Group of Birch Trunks from about 1896. Fritz Overbeck (1869–1909), Two Birch Trunks by the Ditch (date not known), oil on cardboard, dimensions not known, Overbeck-Museum, Bremen, Germany. Wikimedia Commons. 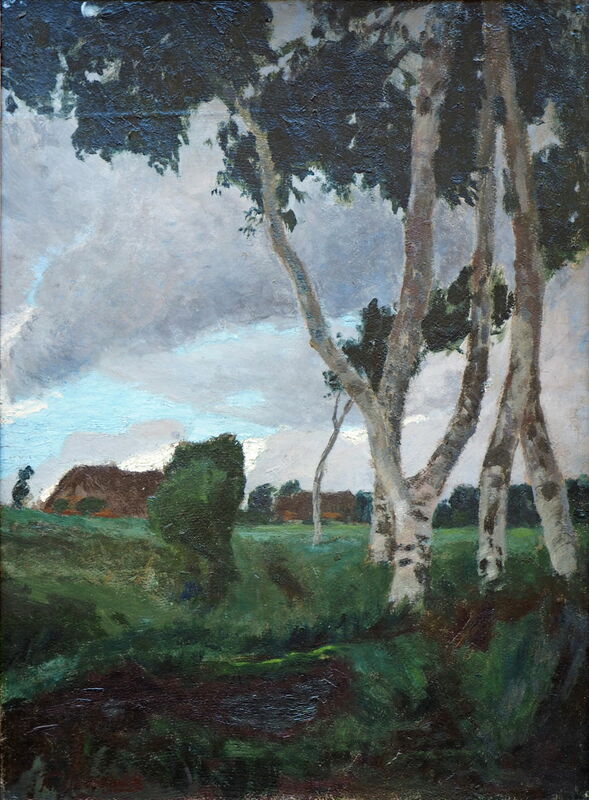 Quite soon after arriving at Worpswede, Overbeck’s paintings assumed higher chroma, as is apparent in this undated view of Two Birch Trunks by the Ditch. Evening on the Moor (1896) is now one of his best-known paintings, with the intense blue of its sky, although the fields and trees have the more muted colours of twilight. Fritz Overbeck (1869–1909), Buckwheat Fields at Weyerberg (c 1897), further details not known. Wikimedia Commons. Where the land rises up from the bog of Teufelsmoor, buckwheat was a traditional local crop. 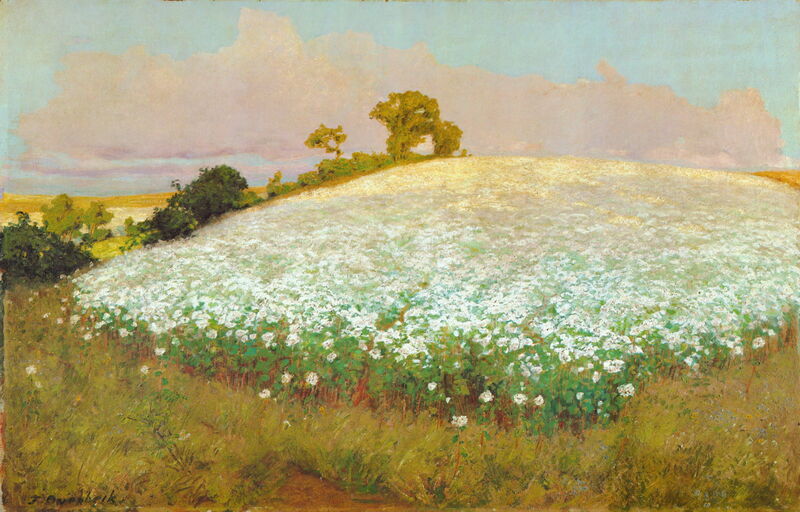 In Overbeck’s Buckwheat Fields at Weyerberg (c 1897) he catches a small field of the pseudocereal in full flower, the upper parts light gold in the light of the setting sun. Buckwheat isn’t a grass at all, but is more closely related to sorrel and rhubarb, with edible triangular seeds. It thrives on the poor, acid soils in this area, provided that they are well-drained. Its cultivation became quite uncommon during the twentieth century. Fritz Overbeck (1869–1909), Fruit Trees in Bloom (date not known), oil on paperboard, dimensions not known, Museum am Modersohn-Haus, Worpswede, Germany. Wikimedia Commons. 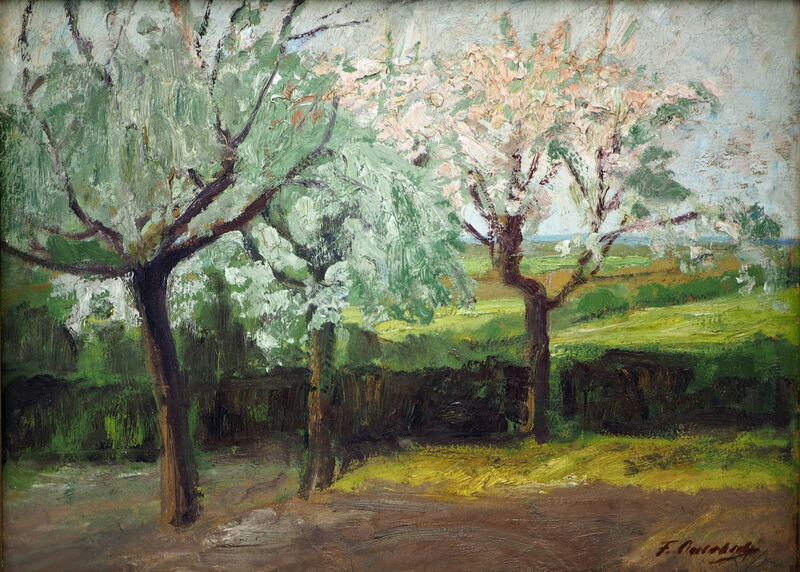 Overbeck also sketched Fruit Trees in Bloom when he was living in Worpswede. 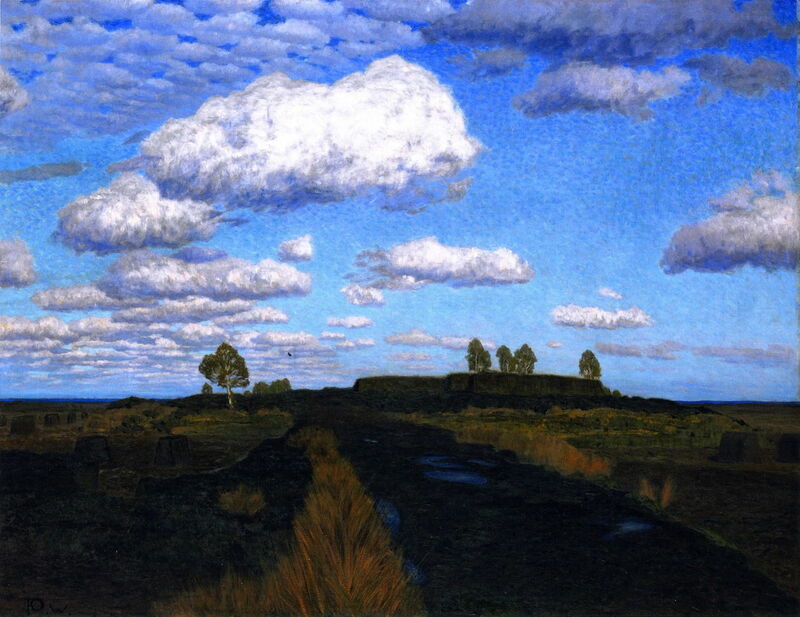 Fritz Overbeck (1869–1909), On the Moor (c 1904), oil on canvas, 156 x 200 cm, Bayerische Staatsgemäldesammlungen, Munich, Germany. The Athenaeum. On the Moor from about 1904 is another view of Teufelsmoor under an intense sky, following rain. In 1904, Overbeck’s wife Hermine Overbeck-Rohte (1869-1937) was diagnosed with tuberculosis. Hermine Overbeck-Rohte (1869-1937), Drying Washing (1896), further details not known. Wikimedia Commons. Overbeck-Rohte appears to have been an accomplished landscape painter, working primarily en plein air, but even fewer of her works are now accessible. 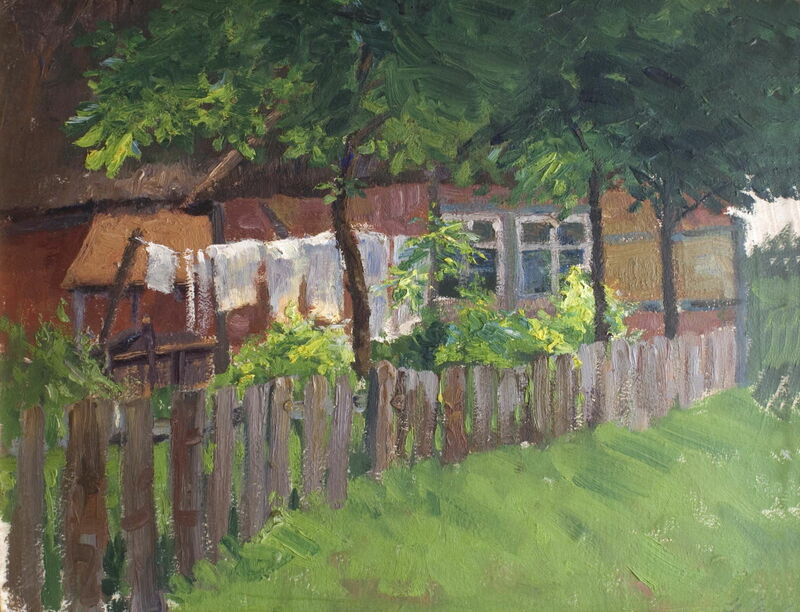 Perhaps the best example is this rough-hewn oil sketch of Drying Washing (1896). Hermine Overbeck-Rohte (1869-1937), Path in a Hollow (Defile) (1896-1904), oil on canvas, 78 × 92 cm, location not known. Wikimedia Commons. 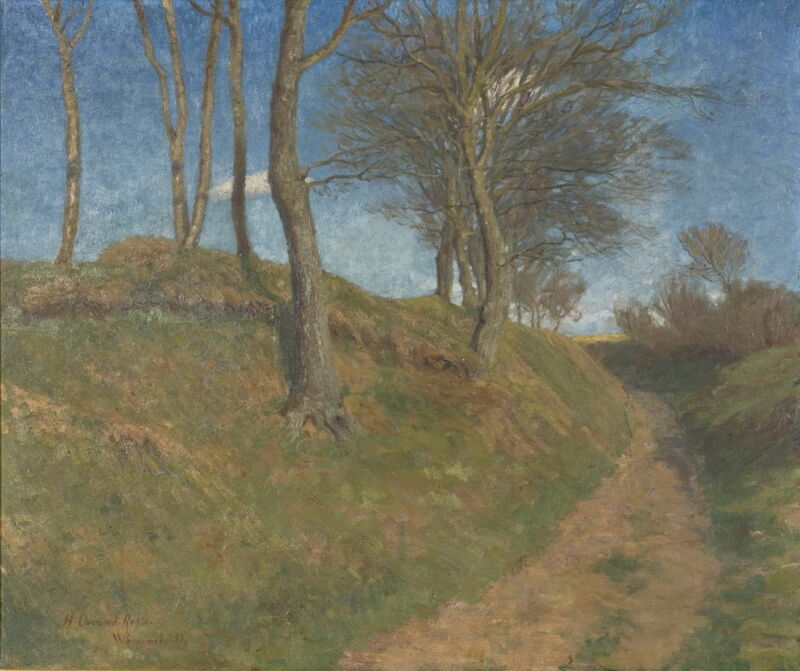 Her painting of a Path in a Hollow, or a defile, probably dates from around 1900, and is the only other work of hers which I have been able to locate (at sufficient resolution for use here). This too was painted when the couple were raising their family at Worpswede, and before she was diagnosed with tuberculosis. As Overbeck-Rohte weakened with ‘consumption’, she found it too taxing to sit up to paint, so her husband designed her an easel which allowed her to work while still recumbent. The following year, they left Worpswede for the nearby town of Vegesack, now the northern suburbs of the city of Bremen. Her health worsened again in 1908, and she took to a sanatorium in Davos, Switzerland. Shortly after she returned to Germany, Overbeck died suddenly of a stroke, at the age of only 39, leaving her to raise their son (who became a distinguished botanist), and to preserve the legacy of her husband’s art. She died in 1937, and in 1991 her paintings were shown in her first solo exhibition, thanks to the efforts of the foundation set up by her granddaughter. Fritz Overbeck’s teacher Eugen Dücker (1841-1916) worked for most of his career in Düsseldorf, where he was one of the influential members of the Düsseldorf school of painting. Another of his students was the Norwegian landscape artist Adelsteen Normann, who was to play a key role in the history of art when the colony at Worpswede was only just getting started. I will tell that story in a couple of days. Posted in General, Life, Painting and tagged Dücker, landscape, Modersohn-Becker, Overbeck, Overbeck-Rohte, painting, Rohte, Worpswede. Bookmark the permalink. Very nice and informative article!